Things have been so bad for emerging market equities of late that the MSCI Emerging Market index has now declined over 20% from its January high on both an intraday and closing basis. That officially puts the index in bear market territory. 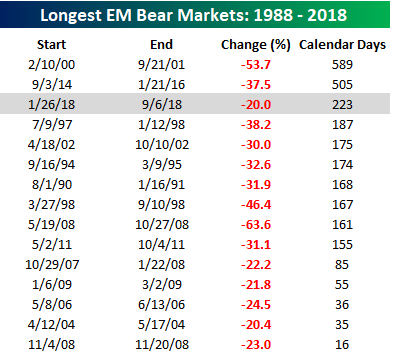 What’s particularly noteworthy about the current bear market for EM is that even though it is far from the most severe of the last 30 years, it already ranks as the third longest. The only longer declines of 20% or more in the index (without a 20% rally) were from February 2000 through September 2001 (589 days) and September 2014 through January 2016 (505 days). 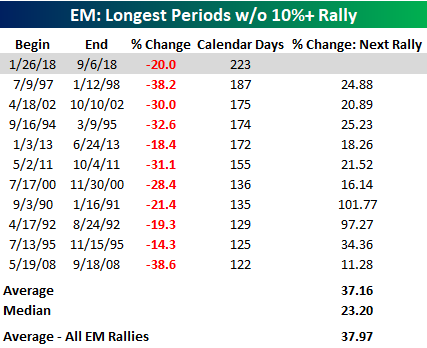 Even more significant, in our view, is the fact that the current downturn in EM is also the longest stretch without a 10%+ rally (223 days) in over 30 years. Going back to 1988, there has never been another period where EM went more than six months without a 10% rally. 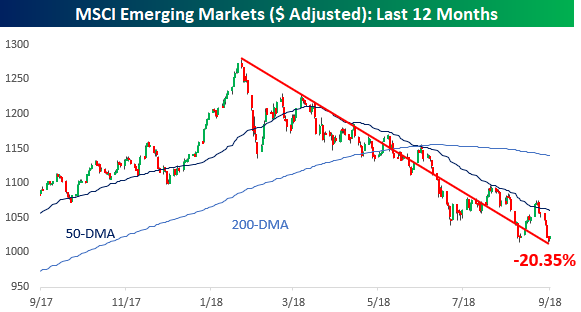 Looking ahead, when EM finally did turn, the average rally was just over 37%, which is right inline with the historical average. In today’s Chart of the Day for Bespoke members, we looked at the huge performance gap between the US equity market and emerging markets so far in 2018 and whether or not it can last. Start a two-week free trial to any membership level to give it a read.